Super Thunder Blade (スーパーサンダーブレード, Super Thunder Blade?) is a shooter for the Sega Mega Drive/Genesis console, published by Sega. It was one of three launch titles for the console in Japan (along with Space Harrier II and Altered Beast), as well as being one of the six launch titles for the console for its U.S. launch. It is a follow-up to the 1987 arcade game Thunder Blade. It was released for the Virtual Console on September 17, 2007. It was also included in the Sega Genesis Collection for PlayStation 2 and PSP in 2007 and in Sonic's Ultimate Genesis Collection for Xbox 360 and PlayStation 3. 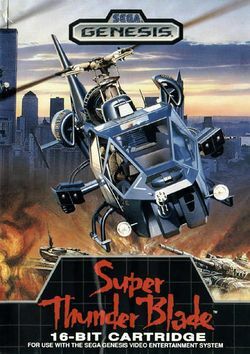 As in its predecessor, the player takes control of a helicopter which is used to attack a group of guerrillas. The helicopter itself uses guns and missiles, and can also air brake. A distinctive feature that also appears in the arcade game is the use of different viewpoints during the entire game; during normal gameplay and when fighting sub-bosses, the game utilizes a third-person perspective from behind the helicopter, similar to Space Harrier, but the camera changes to a top-down perspective when fighting bosses. Super Thunder Blade had four stages of play. Super Thunder Blade is the title of the Sega Genesis release. This was done to differentiate it from the Sega Master System release, known as Thunder Blade, which was a port from the arcade version. There are few differences between the arcade and Genesis versions, save for some minor level development changes and the gameplay; the initial top-down sections (occurring before the third-person sections) were omitted from the Mega Drive version, but a mid-boss battle was added in the middle of each third-person section. This page was last edited on 11 June 2017, at 22:29.